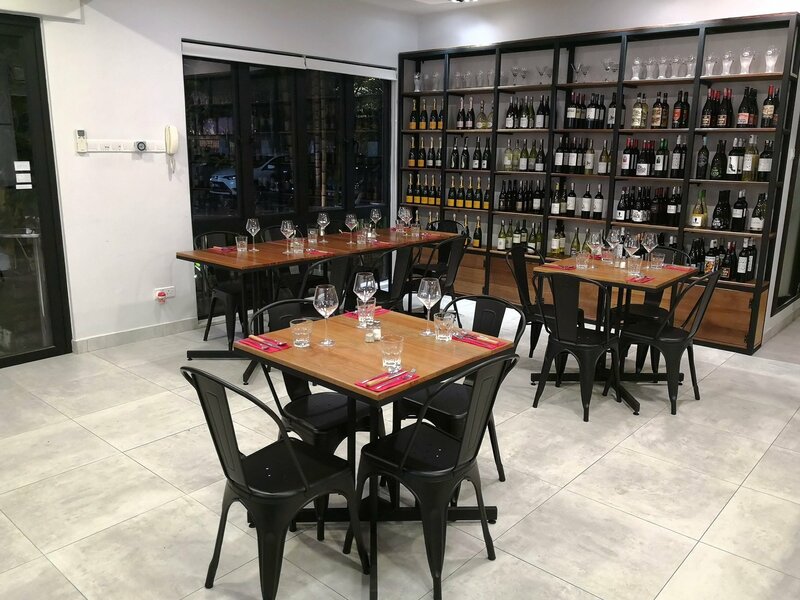 Headed over to the new La Cave Bistro in Mont Kiara (located opposite the international school) recently for a preview of the new establishment and its menu. 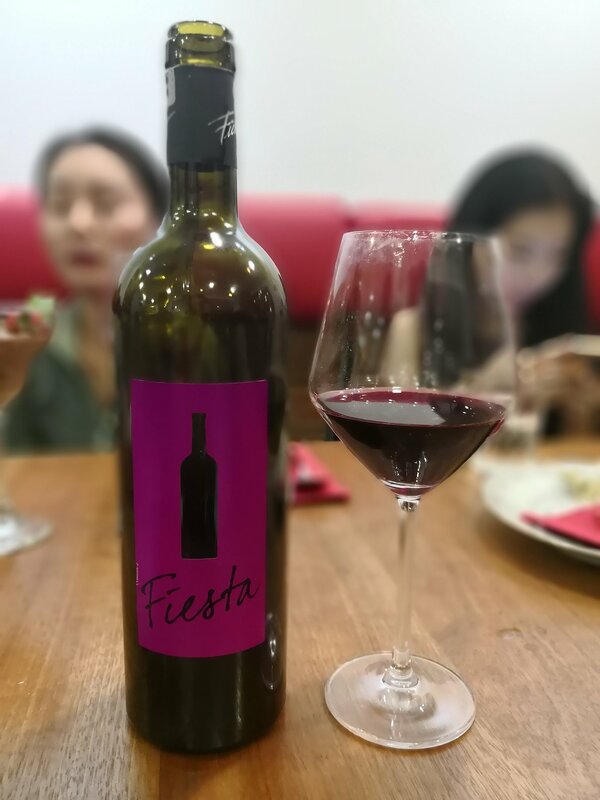 This new outlet is under the same management and owners as La Cave in Jalan Telawi 5, Bangsar Baru and thus retains some similar features such as the extensive yet affordable wine selection. However, the outlet in Mont Kiara is different from the Bangsar Baru outlet as it’s a more dining/ food centric outlet. 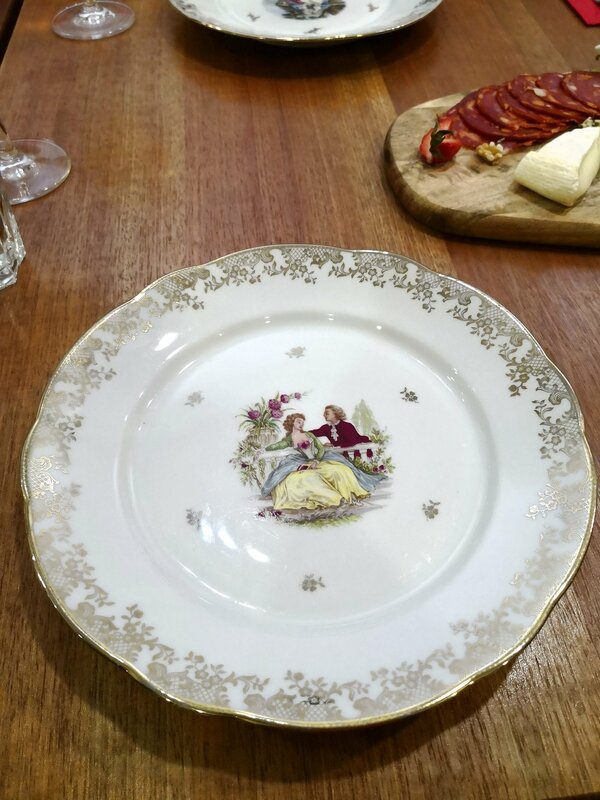 focusing more on dining as opposed to the Bangsar outlet which is more of a retail + bar. The dining area is adequate to fit 30+ diners in comfort and there are a couple of high tables outside in the al fresco area. 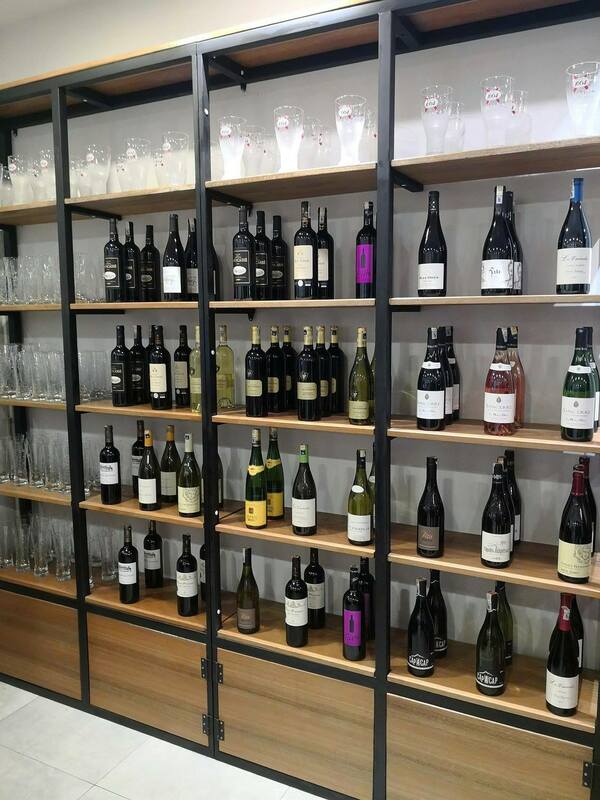 La Cave retails wines from 14 different countries as well as having Halal wines to provide diversity for the Malaysian market. Being importers as well, they have wines ranging from an entry-level RM50 bottle all the way up to RM400 onwards with 200 labels to choose from. At La Cave, you can enjoy a glass of fine wine, mug of imported beer or favourite spirit. La Cave was the idea of two rugby mates, Donnie Maclary and Florian Paul Raymond. They both share a passion for quality wine and love of socialising. 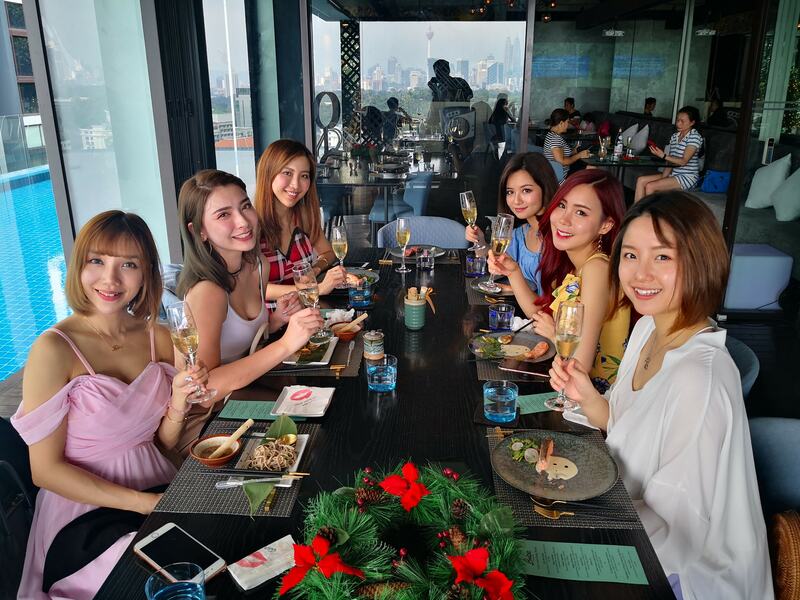 Naturally, they wanted to try and share these passions with everyone in Kuala Lumpur, as well as make quality wines accessible to more consumers. 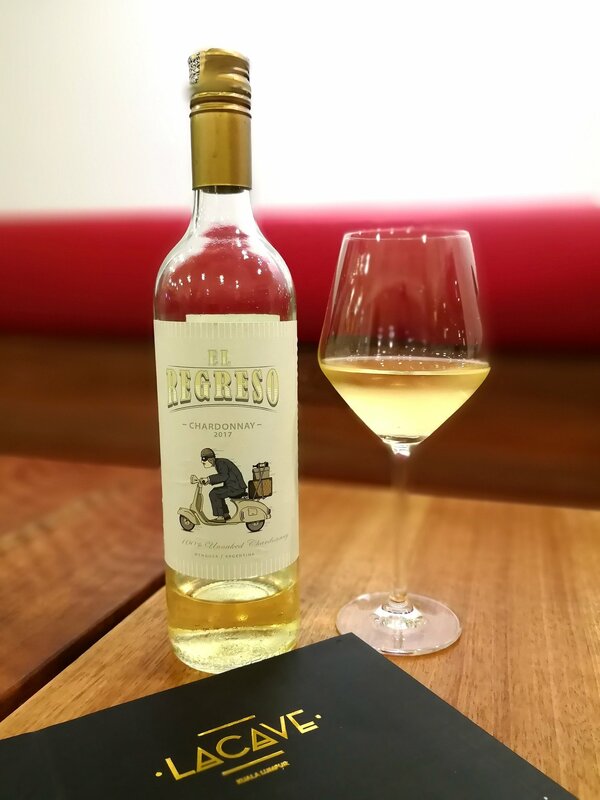 Their mission is to source the very best of wines and spirits from around the world, both Old and New World, and to offer customers a wide selection of fine alcohols to choose from, previously unavailable in Asia. Walking through the doors, you will feel as if you are walking into a local wine bar in any European city. Apart from the wide selection of wines, the outlet also serves Carlsberg and Kronenbourg 1664 Blanc draughts on tap, as well as a few selections of popular liquors, available in glass or bottle. FLORIAN PAUL RAYMOND is a Frenchman who was born into a family of winemakers (4th generation) from the Madiran region of Southwest France. With a Bachelor in Oenology and Viticulture with a specialisation in “organic and biodynamic” wines as well as another Bachelor from INSEEC, a prestigious wine business school in Bordeaux, France, in the business and marketing of wine and spirits, Florian has been in the wine business for as long as he can remember. Mentored by Alain Brumont, owner of Chateau Montus and Bouscasse, Florian advised, trained, sold and distributed wines in Vietnam for almost 2 years before relocating to Singapore where he worked for a premium Italian wine dispensing system, selling to an international clientele across Southeast Asia. Florian has imported and distributed wine for the past 5 years in Malaysia. 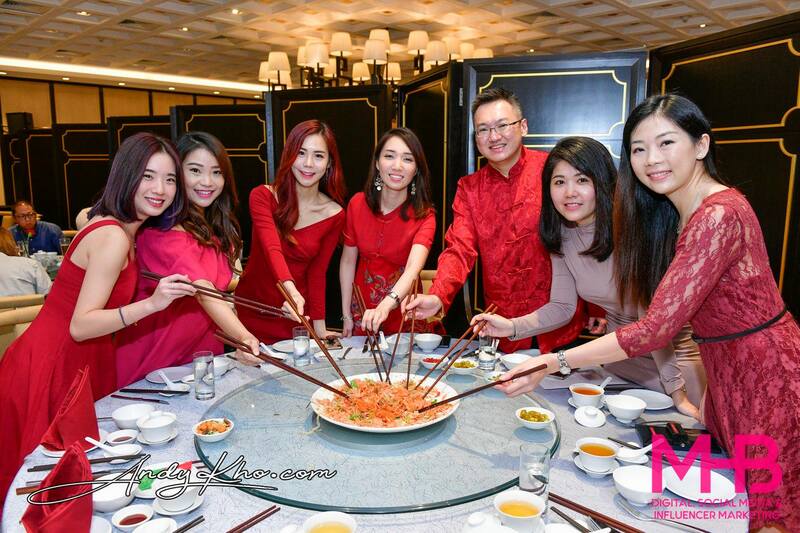 A true wine connoisseur, he hopes to share his knowledge and experience of New World and Old World wines with Asia’s growing market of wine lovers. Florian crossed the world being in France Madiran (first winemaking fortified wine with “Tannat”), Saint Chinian (Languedoc, thesis on organic and biodynamic wine), Morocco (thesis on the micro oxygenation on the grape ‘Syrah’) and in Australia (Connowarra) learn more about the Cabernet Sauvignon grape. DONNIE EUGENE MACLARY is from the United States where he grew up on the beaches of Virgina. He has always had the spirit of an entrepreneur. In fact he has been working since the age of 12 starting his first business as a landscaper. In his teens he was an Ocean Rescue Lifeguard protecting the shores of Virgina. While in college he was a national level swimmer. Most of his adult life was spent served in the US Army. Where he has served in Iraq, Kuwait and Korea as Combat Medic and Operations Officer. While getting his MBA he did a case study on Southeast Asia which was the first time he thought about heading to Malaysia. After thinking it over for more than a year he decided to get out of the Army and move to Malaysia with just a bag of clothes and three surfboards. Donnie was only in Malaysia not even a year before he felt Malaysia specifically Kuala Lumpur was home because of the easy accessibility of great beaches and surf breaks. Luckily, one of his co-workers was a ruby player because of it wasn’t for this him and Florian would have never met. After playing with a local rugby team Florian and Donnie found out that they shared a lot of the same passions especially for good wine and socialising. So they decided to invest in themselves and La Cave was made a reality. 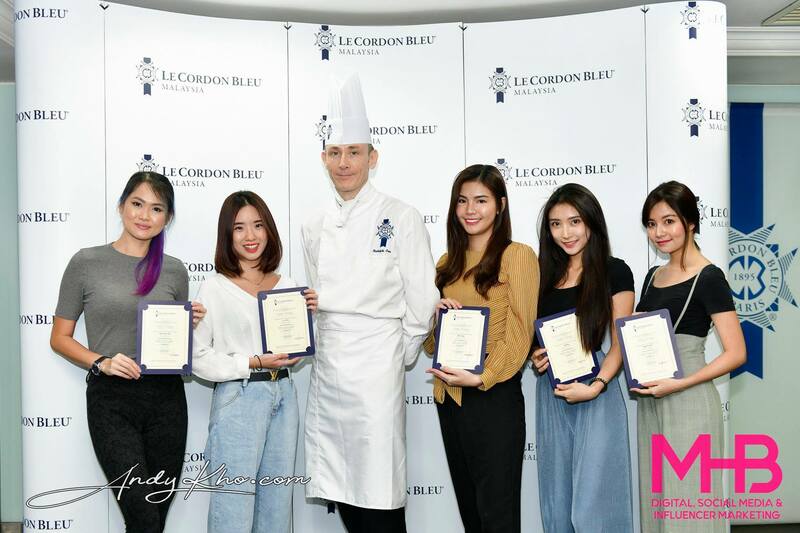 Manning the kitchen is Chef Aida Hani Khalid who was previously a private chef for the Audi R8 LMS Cup racing team. We got to try all of her creations that evening! 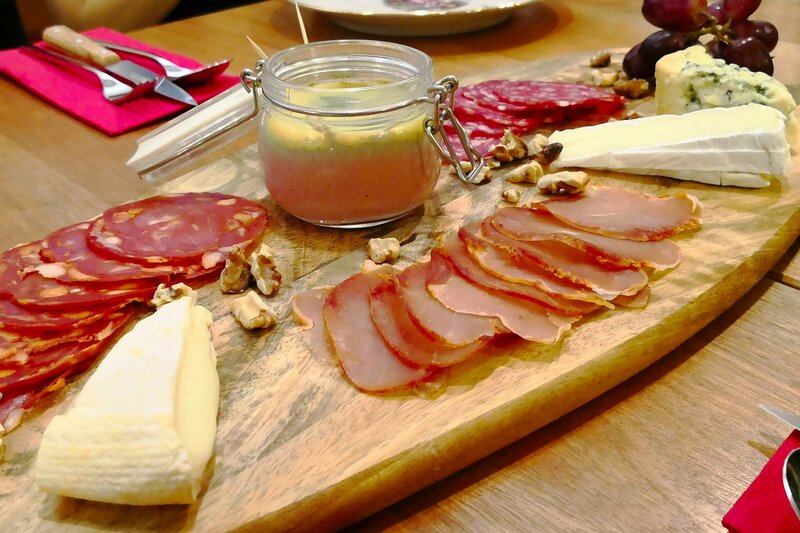 Chef’s selection of 7 items in-house including cheese, cold cuts and pate. This one is great for sharing over a bottle (or two!) of wine! Try mixing and matching the different cheeses and cold cuts and even the pate with different wines, be it red or white, and see which goes well with what. The chicken liver pate might not be everyone’s cup of tea, but to me it went well with the warm and crusty toast. BTW the bistro is pork-free so expect proteins like beef, duck and chicken on the menu. Red watermelon, arugula, smoked duck breast, cucumber, ricotta cheese, walnut, croutons with balsamic reduction vinaigrette. 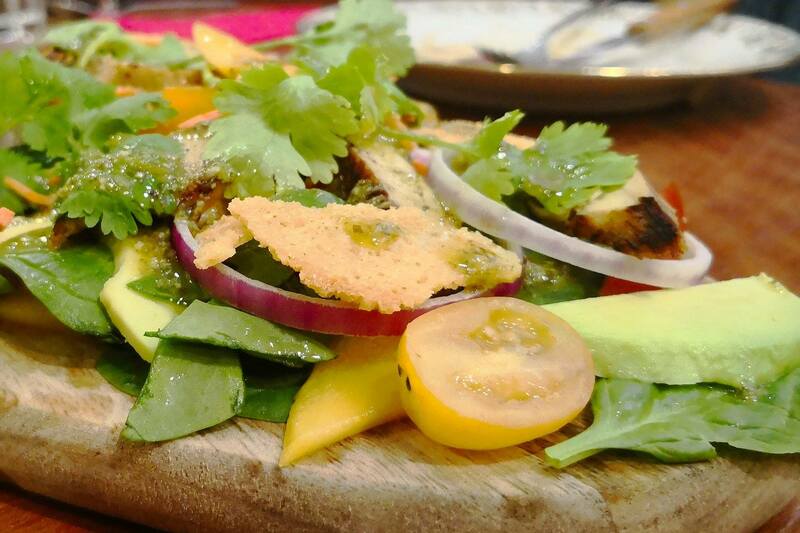 A very well-balanced and fresh tasting salad that’s sure to perk up your tastebuds! 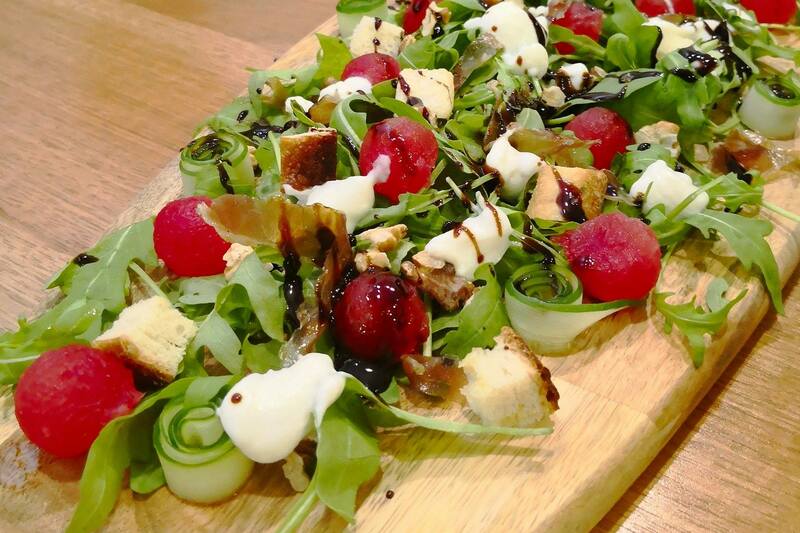 I enjoyed this salad with the Chardonnay as the fresh flavours complemented each other! 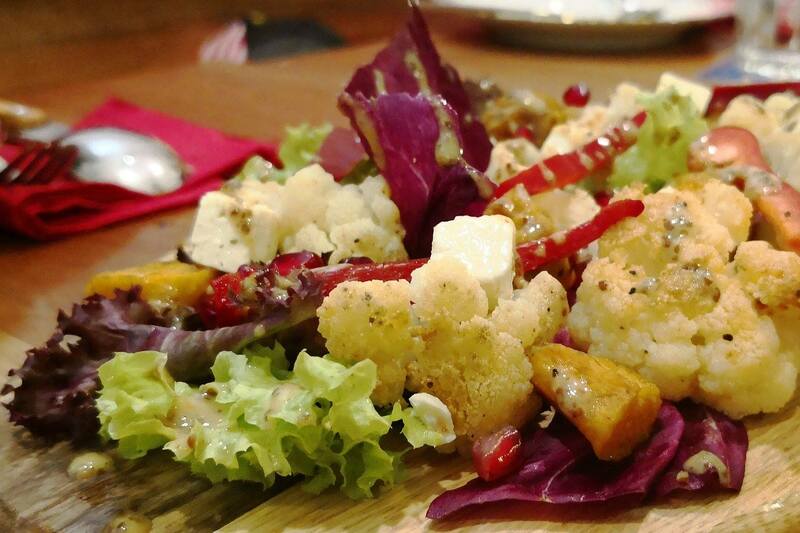 Roasted pumpkin, cauliflower, mix lettuce, red pepper, pomegranate, feta with honey mustard dressing. I’m not a fan of cauliflower however I must say that the balance of flavours and textures that made up this salad was pretty good! The pomegranate especially, had a lovely texture and had a burst of piquancy to balance out the sweetish honey mustard dressing. Mango, Spanish onion, avocado, tomato, carrot, smoked chicken breast, spinach, parsley, parmesan comb with parsley & sunflower seed vinaigrette. Oooh I loved the Parmesan “comb” which was my favourite element of this salad. This too was more on the fresh and light side especially with the sweet and vibrant mango! 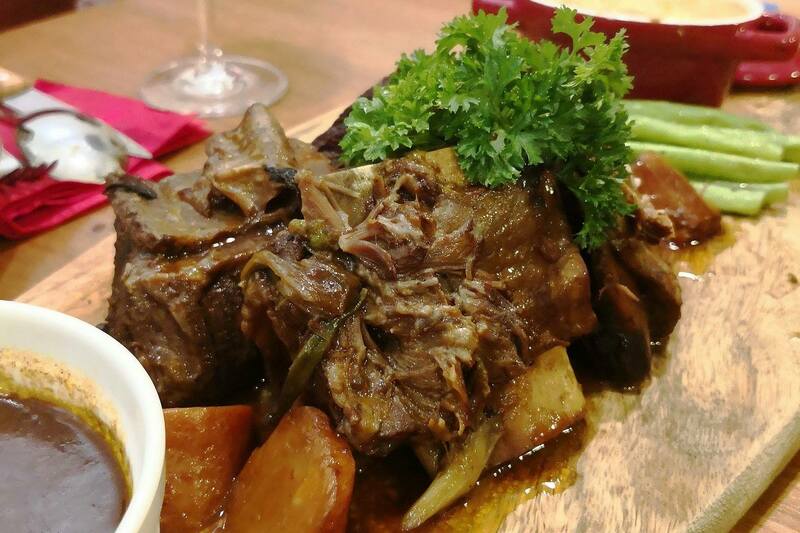 Perfectly tender slow cooked beef short ribs in rich homemade red wine broth. Served with cauliflower au gratin and buttered French beans. This one was hands down everyone’s favourite dish of the evening! Tender and flavourful beef ribs slow-cooked for hours ensuring that the meat just fell off the bone! 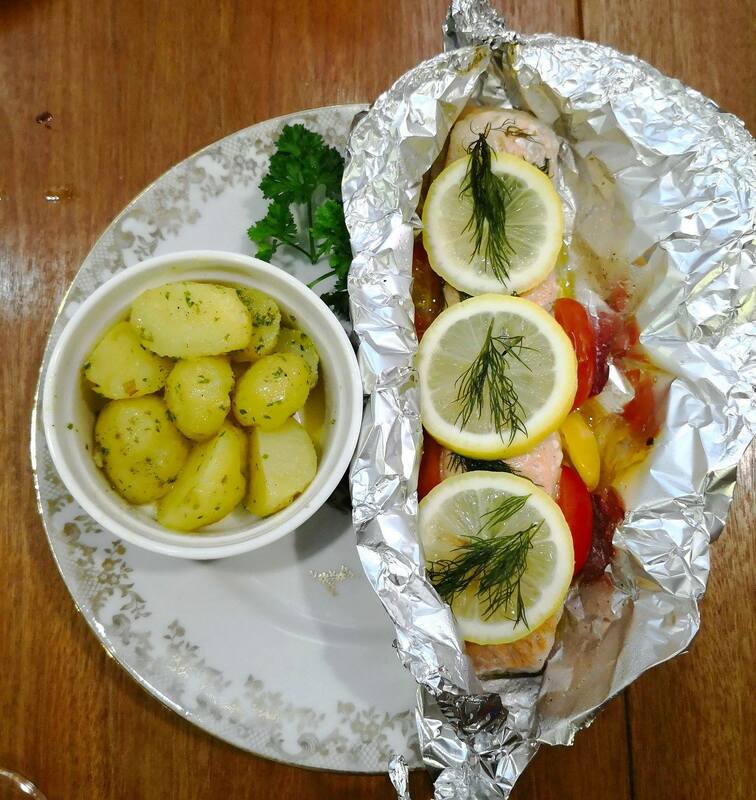 A fine piece of salmon cooked till perfection in parchment with citrus juice & herbs served with boiled potatoes & cherry tomatoes. I actually use this style to cook salmon at home when I’m not pan frying it. The result is a tender and juicy piece of salmon (as opposed to a dry one if you’re not careful when pan-frying it). This is a classic French dish that was executed to perfection. Juicy & tender grilled spring chicken marinated in special homemade recipe served with grilled onion florette & roasted sweet potato wedges. 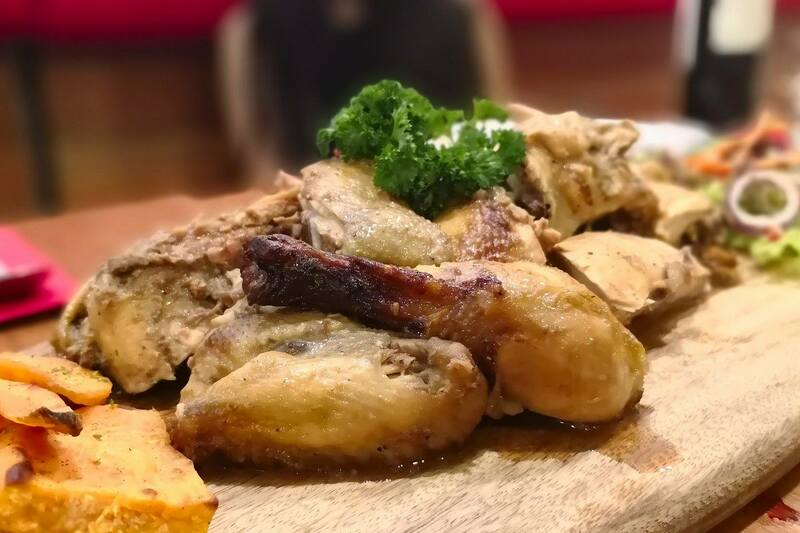 Chef Aida really has some skills as the chicken turned out really tender and juicy! This one could easily be shared among 5 – 6 people. Caramelized banana & peach in fragrant citrus juice topped with crunchy oat crumble serve with homemade vanilla ice cream. 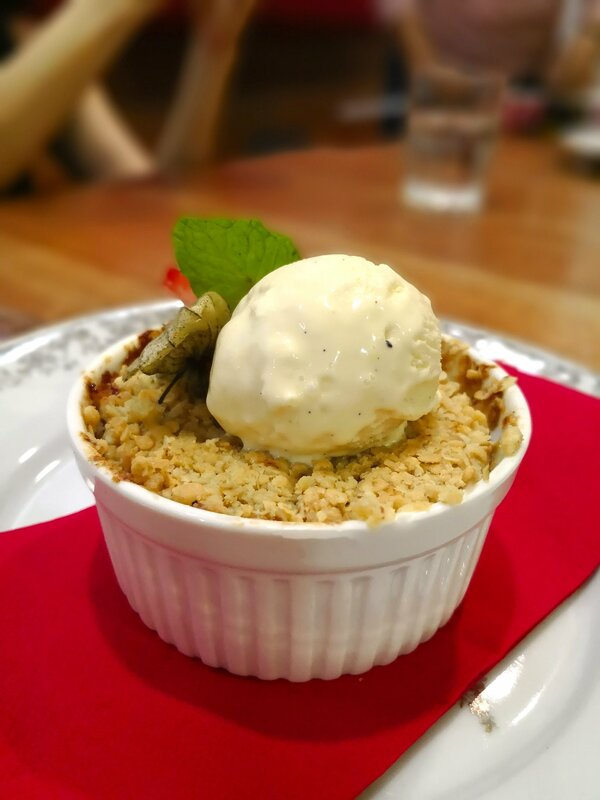 A lovely combination of banana and peach with a hint of citrus juice, with a contrast of texture in the form of the oat crumble, and complemented with the house made vanilla ice cream! The girls loved this one! Delicately creamy thickened cream serve with fresh tangy passion fruit & seasonal berries. 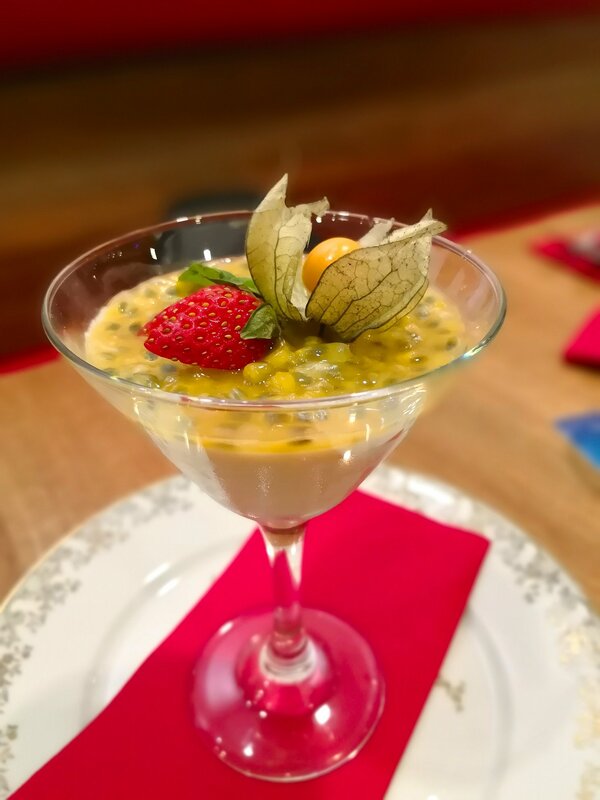 Certainly not your average Panna cotta as this one had passion fruit and seasonal berries providing a good measure of piquancy and sweetness to balance the creamy dessert! 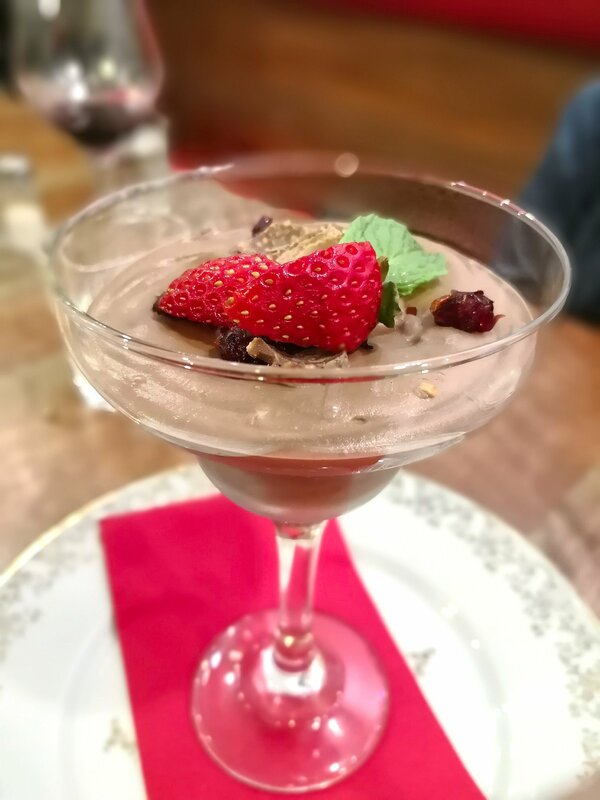 Rich & chocolatey mousse with crunchy crushed almonds & brandied cranberries. Although I’m not a dessert person, I do have one weakness and that is – chocolate. This Chocolate Mousse was done to absolute perfection. So good that we requested for an extra one (greedy!). Rich with some variance in texture thanks to the crunchy crushed almonds, this went perfectly with a nice glass of red wine! Many thanks to La Cave for having us!